My mom and I love pound cakes. Since Cinco de Mayo is right around the corner, I shared this one with her at one of our recent visits. We loved it. 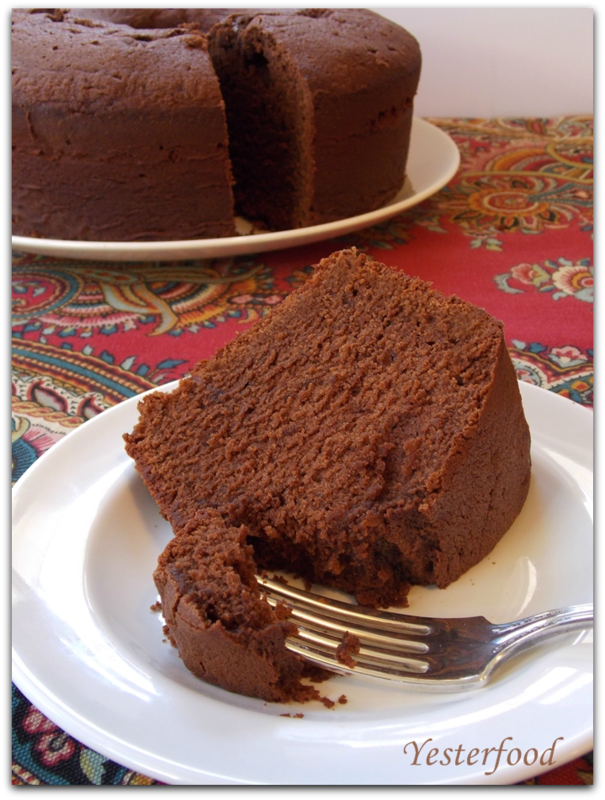 It's rich and dense and moist like a pound cake should be, with just the right amounts of chocolate and warm cinnamon. My mom and I had ours with fresh sliced strawberries and whipping cream (so pretty! ), but to tell you the truth, I prefer it plain. The flavor and texture of this cake doesn't need a bit of help. 1. Microwave chocolate baking squares in a small bowl, stirring every 15 seconds, until chocolate is melted and smooth. This should take about 1 minute. 2. Beat butter at medium speed with an electric mixer 2 minutes or until creamy. Gradually add sugar, then beat until light and fluffy, about 5 to 7 minutes. Add eggs, 1 at a time, beating just until yellow disappears after each addition. Stir in melted chocolate, chocolate syrup, and vanilla until smooth. 3. Combine the flour, cinnamon, baking soda, and salt. Add to butter mixture, alternating with buttermilk, beginning and ending with flour mixture. Beat at low speed just until blended after each addition. Pour batter into a greased and floured 10-inch tube pan or a 12-cup Bundt pan. 4. Bake at 325° for about 1 hour and 10 minutes (start checking at about an hour; be careful not to over-bake) or until a long wooden pick inserted in center of cake comes out clean. Cool in pan on a wire rack 10 to 15 minutes; remove from pan to a wire rack, and let cool completely. Cook’s note: You may substitute Mexican chocolate for the baking chocolate and cinnamon in this recipe. This cake may have been taken to some of these great parties! Yum...chocolate cake is so inviting and the picture makes me wants to reach in a get a slice! I do love pound cake, Joy! Make it chocolate pound cake and I am lovin' it big time! The texture of this cake looks so scrumptious. Thank you for sharing the recipe. Linda, I knew you were a woman after my own heart! ;) Thank you so much for coming by!! I can not pin this fast enough! I have leftover buttermilk from my baked chicken earlier in the week, and now I know how to use it. Thank you!! I need to try this cake! Though I do not celebrate Cinco de Mayo this cake would still be great for any occasion! What chocolate syrup do you use? Thanks so much for that, Joy! Hi from Three Dawg Lady.....following you on bloglovin! Sounds absolutely delicious - and really BAD for one! As all chocolate cakes should! Thanks for both sharing this recipe, and hosting this blog hop party! Hi Joy. I found your blog thru the 'Let's Get Social Sunday Linky Party', I'm link #34. You have a nice blog with lots of great recipes! I'm following you thru Bloglovin' now. Hi Joy, Hello I found your blog through Let's Get Social Sunday, your recipes look delicious!!! New follower here via Google+ and bloglovin. I invite you to visite my blog and if you like my creations I hope that you will consider following me back. You had me at Chocolate and Buttermilk~~~Beautiful cake and I am sure delicious! This looks very appealing to me, I will definitely make it for a family gathering! Do I have your permission to share it and give you credit on my blog? Oh, I'm so happy that you tried it and that you loved it! Thank you for letting me know!! :) Have a great week! Shannon, thank you- it IS really good with coffee! :) I enjoyed my visit to your blog- I am now following you on Google+, FB, and Pinterest! Oh my my my....i LOVE chocolate and cinnamon together! This looks so sinfully divine! Visiting from Inspiration Cafe! This looks decadent and rich, rich, rich!! I want some. :) Thanks for linking up over at the IC! Oh my gosh this looks so good! Can't wait to try it! Felicia, it really is good! If you try it, I hope you enjoy it as much as we did! :) Thank you for visiting!! Buttermilk, chocolate, cinnamon!! What's not to love. Thanks so very much for sharing your recipe. Thank you, Sande! They are all favorites of mine, too! :) Thank you for stopping by! I love cinnamon with chocolate! The texture of your cake looks fantastic. Thank you for sharing w/ See Ya in the Gumbo this week, Joy! Yum, yum, yum!! That looks delicious! I love your blog name, my son used to say "yester-night" instead of yesterday! YES please!!! Oh that looks great. Oh wow, looks like this would be perfect with a big glass of cold milk! Thank you for spreading JOY and sharing at the Oh What a HAPPY Day party. Holly, I like the way you think! ;) Thanks for hosting such a great party! This sounds so good! I may have to try it out soon. I'm a new follower from Oh What a Happy Day party. Have a great day! I have seen this cake each time I open facebook... tempting and taunting me. It looks so good Joy! pinning it and I will be making this soon. Marlys, I will put a black bar over the picture! :) You are sweet to come over and visit me! If you make the cake, I do hope you enjoy it! This sounds delicious! It looks beautiful too! This looks delicious! Perfect for a Cinco de Mayo dessert! I saw this today on Krista's link-up....now I need a glass of milk!! Oh, Kim, you are so sweet- I really like cakes, too- we must be Cake Sisters! ;) I'm so glad you came over from Krista's- thanks!! There is no way this could be anything but awesome! I'm pinning it for the 5th! (and any other time I need it!) Thank you for sharing it at the Inspiration Cafe's first link party! Chocolate and poundcake? Can it get any better?! I will absolutely be trying this.Thanks for sharing it with us at A Bouquet Of Talent!Have a great weekend! That is a pretty good combination, isn't it? :) Thanks for having a great party!! It was nice to have this cake at my party! ;) So glad to have you link up with us! Just wondering if anyone has substituted coconut oil for the butter? I tried half butter and half coconut oil and it was amazing!! Took it to work for Cinco de Mayo yesterday (I'm a nurse) and everyone RAVED! I love pound cake and the chocolate and cinnamon together sound wonderful! Thanks for sharing. Rita, thank you so much- I love chocolate and cinnamon together,too...something kinda magical happens when those two get together! :) Thanks for coming by! Thanks you for sharing this at the top blogger showcase for April 2013. Pinning this. That cake looks wonderful and I may have to make it for our anniversary this week! Thanks for sharing. Just stopping by from the Say it Saturday Linky Party. Hope you get a chance to do the same! I'm a new follower and look forward to more of your sharing. Stop by and say hi when you can! Thank you, Anyonita, and thanks for pinning!! :) I will be at the party! Thanks for linking up at One Organic Mama! Hope to see you back on Thursday morning! Just delightful! Thanks for sharing at Saturday Dishes. Pinned! This looks amazing! Thanks so much for linking up wtih "Try a New Recipe Tuesday!" I can't wait to try this. :-) I hope you will be able to join us again this week. Gidday Joy. This looks so good. Thanks so much for always linking up to Thriving on Thursdays. Its always great to see you each week. I'm featuring this one at this week's party. Angela, thank you so much, and thanks for coming by! I have linked up to your party, and am following you! Great to meet you! That cake looks just perfect. And now I so want a slice, is there any left? Be right over! Thanks for linking with me, see you tomorrow! I found you through Church Super at EMM and I am so glad because this recipe looks amazing. I don't have the chocolate syrup in the house so I might have to make some in order to make this yummy cake. Who doesn't like a great pound cake and chocolate makes it even better. Alison, thank so much for coming over from Church Supper- it was my first week to link up there and I love it! I am happy to meet you and to be following you! What a great combination - pound cake and chocolate! Yum both of my favorites. Your photo is beautiful! Thank you so much, Terri- it's one of my very favorites, too! :) Thanks for coming by!! Wow. I've scanned through the comments and I've got to say that mine is just one of the many saying OMG this looks like something I need to put into my mouth immediately! Can't wait to try it out! Rhonda, this really is my very favorite cake- if you make it, I hope you love it as much as we do. :) Thanks very much for the visit- I appreciate it! This Mexican Chocolate Pound Cake looks so MOIST! Great job! Thank you so much for stopping by and linking up at Saturday Dishes 'CHOCOLATE" Blog Hop. I pinned it. How incredible does this look?! YUM! Wow, there are a lot of folks who really love this Mexican Chocolate Buttermilk Poundcake and guess what, I am one of them. This cake is fantastic and looks like it would be so moist and delicious! Thanks so much for joining our Foods of The World Tour to Mexico, hope you will join in France next month. I was wondering if I wanted to make a plain vanilla cake, what would I substitute the chocolate syrup with? I assume if I substitute it with milk/ butter milk, that would make the dough too runny.